Alright, I was trying to avoid this topic, but I have been asked by a couple of people, so I am breaking down and posting about it. But can I please preface this with a disclaimer that I am far from an expert! I've successfully potty trained three of my four children, all with similar tactics and very different results. To begin, our oldest son started showing signs of potty training readiness at age 2.5. I count readiness as staying dry for longer periods of time, telling us when they are going in their diaper, being fairly dry at naps and at night time, etc. Soooo....being a first time mom, it was a go! We had many successes, and some failures, but as far as potty, we were on a roll. However, we realized, early on, that the whole poop thing was going to be much more challenging. It was pretty much a no-go from the start. We had a lot of tears, resistance and regression any time he had to poop on the toilet. What?!? It wasn't supposed to be this way. We tried for a couple more weeks and then, when we realized, he was regressing on the potty because of his fear of pooping, we quit everything cold turkey and went back to the diaper. I felt defeated as a mother. Fast forward to when he had just turned 3. Our new baby was about 3 months old and I went in with a little more confidence this time. We chatted with the pediatrician at Jake's 3 year appt and realized that he had some medical issues that contributed to our potty training problems. After some serious doses of Miralax, a modification in his diet and a more relaxed approach, we had MUCH more success! I won't lie, we struggled with the pooping issues for at least a year, but because of the medical interventions, we were headed in the right direction. With toddler #2, I was so afraid to experience the same issues that we did before, that I actually think I held off potty training longer than I needed to. Brett was 2 years 10 months (and showing lots of readiness signs) when we trained him. He was very different to potty train, as poop was the first and easiest aspect for him. It's funny what makes you excited as a parent. I'll never forget setting Brett on the toilet for the first time and having him poop with no problems. I wanted to jump up and down and scream for joy! I felt like we had just gotten past the biggest hurdle and we'd only just begun. His issues were just forgetting to tell us and having a lot of accidents along the way. He's a VERY busy child and was an even busier toddler. He couldn't be bothered to stop what he was doing to tell us he needed to go, so we went a couple weeks cleaning up accident after accident. But, eventually he caught on, and was fairly easy to train. When he started preschool at age 3, he had a few regression issues, but caught on pretty quickly again. Side note: we were really lucky that all of our kids have amazing bladders and have never dealt with bed wetting issues at night. I know that's hard for some. Finally, our last attempt at potty training took place in March of this past year. Molly was a few months past age 2 and giving us a ton of readiness signs. In fact, if we are being honest, I'm pretty sure she was ready to potty train before age 2, but I was too nervous about starting too early, that I put it off for a few months. It wasn't until she was walking into the living room, getting a diaper out of the basket and saying, "mom, I'm wet, will you please change me?" that I realized, um, maybe it was time. I drove her up to the store to pick out some undies and a new toilet seat, we created a sticker chart for the wall and she was set to go. Molly really wanted her ears pierced so I promised her that, once her chart was filled. Little did I know how quickly it would go! I'm going to tell you the example of a child who really did just get it and never looked back. I'm not saying this to make moms feel bad, because trust me, I've been there done that, but rather to show the wide spectrum of abilities. We loaded her up with juice, to make her have to go to the bathroom a lot, popped her on the toilet after about 15 minutes, and she just went. I thought for sure, it was just good timing on my part, so this time I decided to wait to see if she'd tell me when she had to go. Sure enough, after another juice box and about 20 minutes, the stars aligned and our sweet girl yelled, "I have to go potty". Music to my ears. And that was it. We never looked back. She didn't have day or night accidents and we were in shock and disbelief. Waiting for the shoed to drop. 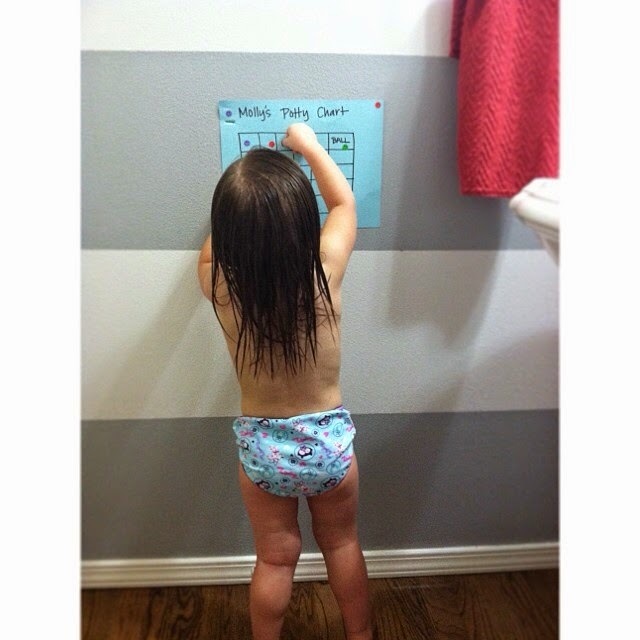 She filled her potty chart in about 3 days and we were on our way to get her ears pierced. So crazy. Hubby and I kept looking at each other, wondering what the heck just happened. I can't even call it potty training because that sounds like I actually did something. She really trained herself and never looked back. So there you have it. Three kids, three different experiences. 1--Wait until they show readiness signs. Pushing a kid when they aren't ready can lead to regression issues and slow the process down, rather than moving forward. 2--Figure out any medical issues before potty training. A child who suffers from chronic constipation may really be challenged. I'm sure there are other medical issues that could hinder progress, as well. Get your child in the best possible position to have success and get your pediatrician involved if need be! 3--Don't pressure! It's easy to have frustration and anger when a child isn't successful or having lots of accidents. I think it's important to focus on the successes and provide a simple, "gosh, looks like you had an accident. Next time, let's tell mommy or daddy when you need to go and we'll sit on the toilet." Reinforce the good and don't spend much time focusing on the bad. 4--Praise, praise, praise!! Children LOVE praise and the more you can do it, the better! Sometimes they'll be in the middle of telling you they need to go and start going down their leg. That is still a success! Or even, when they stay dry for 20 minutes and giving them an M & M. Focus on what they can do well. They love to please! 5--Find a reward that they reallllllly want! My boys were not motivated by a sticker chart, at all--they needed an immediate reward. So, a small treat worked best for them. Molly, on the other hand, loved the stickers and the idea of getting her ears pierced, so it worked well for her. 6--Ignore everything you read. 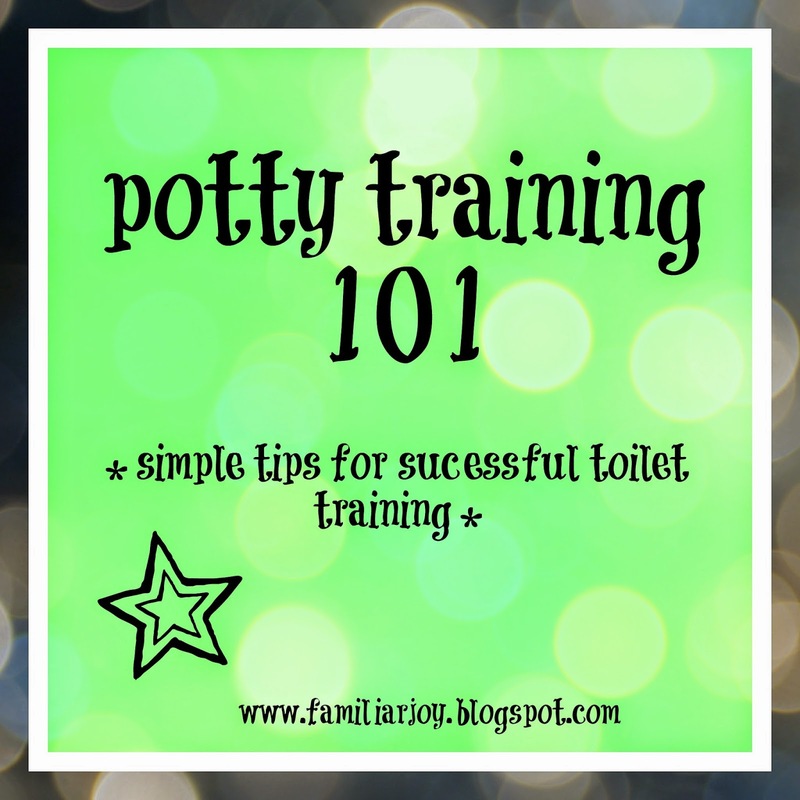 Potty training early does not make you super mom or even a better mom. In fact, if anyone should be labeled "super mom", it should be those of you who have a difficult child to train. Don't let people make you feel bad about the age of your child. All kids are different and ready at different times. 7--Give yourself some grace. You are an awesome parent. Don't base your self worth on how early or late you potty trained your child. Believe me, they'll get there. Even when it feels like they'll be in a diaper until kindergarten, they'll surprise you. Good luck to those of you entering the world of potty training. I still have one child to go, and am crossing my fingers for easy, easy. I mean, she's the fourth child, so she has to be, right?! !